A journey through time, space and dimension as imagined by Binghamton, NY based artist’s “Favorite Color”. How do you give back to this area to make it a great place to live? 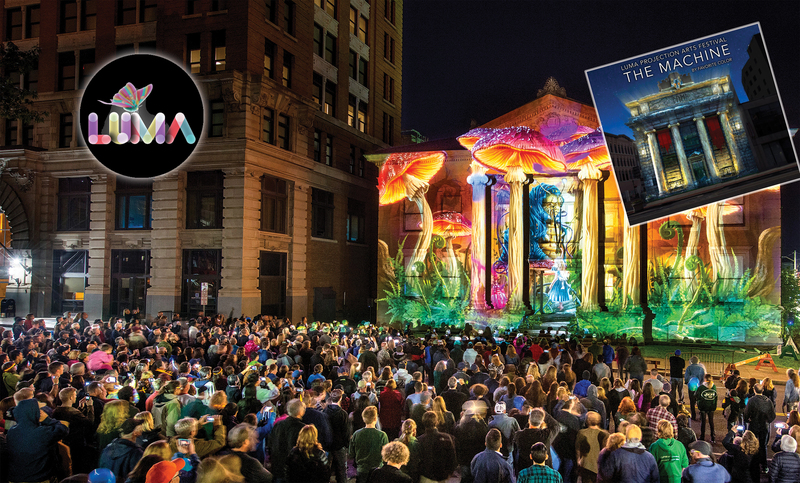 For Joshua Bernard Ludzki it is to produce one of the most loved events of this area, an event that is noted for not just giving people an amazing storytelling spectacular projection mapping event but to help increase tourism in this area as well. The event is none other than LUMA. LUMA was founded by Joshua Bernard Ludzki, Tice Lerner and Nick Rubenstein a magnificent trio of young men with a background in web development, event planning, on-air (radio and TV) work, street photography, graphic design, and film. Their festival which illuminates creative works using the architecture of downtown Binghamton as its canvas brings in more than 30,000 people and $900,000 to this area. “I had been looking for a long time for something truly unique we could produce right here in Binghamton”, said Joshua. “We have so many great assets and the revitalization of downtown was making our restaurants, arts and cultural scenes so vibrant again; but to grow tourism and regional visitations meant we needed to offer something truly different. Tice asked if I knew anything about projection mapping. I had heard the term but didn’t know all that much; when I looked into it, I was blown away. It was happening all over Europe but hadn’t really made its way to the US. I found Binghamton had a TON to offer. But having one big event to draw it all together seemed like a smart branding decision. We want to help visitors rediscover what Binghamton is–what it means–the assets we all already know we have. We were quite taken by projection mapping as an art, but we began to realize that after a dozen years or so it might start to feel like ‘fireworks’–fancy and powerful but without a lot of depth in the long term. We realized that story-telling could be the glue that made our audience stick to the concept long term. So we’re branching out in terms of that idea–focusing more about the intersection of tech and storytelling–the future of storytelling, and how we can play a role”. And this year LUMA has teamed with the Binghamton Philharmonic and the Tri-Cities Opera to help set the emotion of the storytelling.